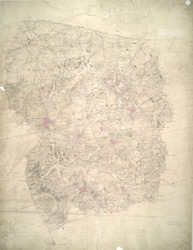 This plan covers part of the English Midland plateau. The Staffordshire and Worcestershire Canal is depicted down the left side. Opened for traffic in May 1772, the canal was built by engineer James Brindley as part of his 'Grand Cross', a far-sighted scheme to link the ports of Hull, Liverpool and Bristol by connecting the rivers Mersey, Trent and Severn. Work on a second waterway, the Birmingham Canal, started a year later to facilitate the transport of coal from the pits of the Black Country to Birmingham. The Industrial Revolution saw over 180 miles of canals and 216 locks built. Part of this network is visible on the plan highlighted in blue.